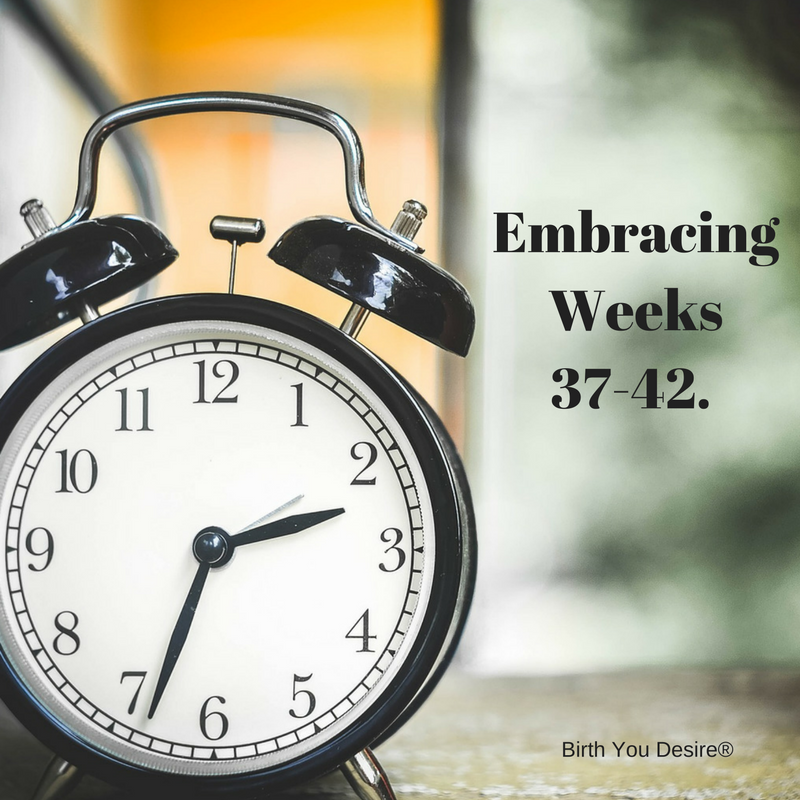 Embracing the end of pregnancy, weeks 37 to 42, can be a real challenge for many couples as you are waiting for the baby that is almost here. Family and friends may be checking in with you daily, asking if the baby has arrived yet. Your ankles may be swelling, your feet may hurt, your pelvis feel heavy, and your body may be continuing to change including stretch marks and swollen breasts. Feeling so big, swollen, and emotional it can be hard to get out of the bed let alone out of the house. Though out the day, it’s not uncommon to vacillate between complaining about your aches and pains and being excited to meet your little one. Many mothers try to stay busy with preparation actives like packing the birth bag to unpacking baby items, setting up the nursery, and having self-care dates. These activities can help to avoid brooding on the upcoming due date or even the past due date. The last few weeks can seem go on forever and yet in reality are just a few short days. Waiting can be especially hard for the typical WDC personality who is always timely and working hard. However this waiting has many benefits. A lesson from pregnancy is learning patience. You will be working around a new human for many years. Waiting to go to the bathroom, waiting to wake up from a nap, and waiting for them to walk and talk. After your baby is born you will have a whole lifetime of time with your baby, so it’s ok to wait just a little bit longer. Focus on the end result of waiting. Think about bringing your baby home. Introducing your baby to children, pets, and family members. Read up on breastfeeding and child rearing. Get excited about the next chapter in your life. Consider a birth month. Instead of giving everyone you 40 week due date. Share a birth month or a range of dates. It is much more common for babies to arrive at 41 weeks than 40. Tell friends and family early on, that you are expecting your baby will arrive late. It may help you to avoid the daily or weekly calls asking if the baby has arrived starting at week 37. Enjoy the attention. Everyone is curious and everyone has an opinion about your pregnancy and or belly.. Enjoy the questions like “When are you due?” And tease the other who say “Wow, you are huge. You must be due any day!” Instead I like asking them “Who me? You think I’m pregnant?”. Or even have fun with them and let them believe you are carrying multiples and are not due for quite some time yet. Stay busy and find time to do self-care. Make a girlfriend date for a pedicure. Go and get one more pregnancy massage. Schedule lunches, walks, and even shopping dates. Staying active will help the time to pass quicker. Scheduled date night. A night out with your honey is more than a distraction technique. It important to nurture your most important relationships in pregnancy and postpartum. During your date, brainstorm ways to continue your ‘dates’ once your little one has arrived.